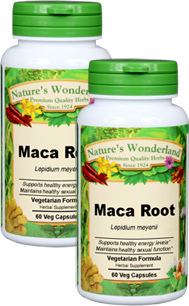 Maca Root Mixed, Capsules, Organic - 675 mg, 60 Veg Capsules each (Lepidium meyenii) - Penn Herb Co. Ltd. The 2,000 year-old Peruvian vitality secret is out! The legendary Maca root boosts energy and stamina, enhances libido and helps your body adapt to physical and mental stress. Our premium blend combines the black, red and yellow varieties for comprehensive and maximum benefits! The restorative tonic is also a powerhouse of amino acids, fiber, minerals and other phytonutrients. No wonder, Maca Root is a popular herbal food to boost athletic performance and overall vitality! Discover for yourself what the ancient Incas already knew! Rejuvenative tonic; boosts endurance & stamina; promotes energy; supports healthy sexual function for men and women; supports male and female reproductive health; supports mental focus; supports athletic performance. Supports male & female hormonal balance; supports healthy stress response (adaptogen); supports healthy adrenal function; supports menopausal health; herbal support for PMS. As an addition to the diet, take 1 or 2 capsules, three times daily with water at mealtime. IF PREGNANT OR NURSING SEEK ADVICE OF A HEALTH PROFESSIONAL BEFORE USE.